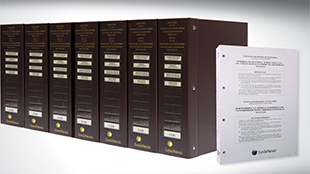 Our extensive collection of national legislation offers a variety of content in a range of formats to suit your needs. 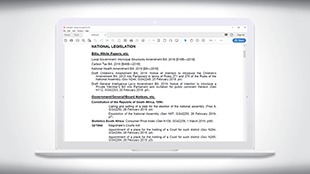 Choose from complete databases of all consolidated and annotated South African legislation from 1910 to date, to legislation by research area, or even individual Acts and regulations. Our content is available online on Lexis Library and in print loose-leaf and bound formats. These are updated daily, weekly, quarterly, bi-annually or annually depending on your choice of format, with complementary updating services. Lexis Library’s National Legislation is a comprehensive collection of consolidated and annotated Acts, Bills and subordinate legislation from 1910 to date, including draft and repealed legislation and amendment Acts. It is updated daily and accessible to browse in alphabetical or chronological order or by research area. All pending amendments are included and clearly distinguished from current legislative provisions. Advanced search and other Lexis Library functionality. View and compare historical versions of Acts and sections with Point-in-Time. Published in 9 hard cover volumes with the Acts arranged under 35 subject titles. This collection contains all current consolidated and fully annotated Acts from 1910, with the exception of purely financial measures. Principal Acts appear in full with all amendments incorporated. Amendment Acts are presented in a summarised form. Pending amendments not yet effective are set out in text boxes to distinguish them from current legislative provisions. Volumes 1A and 1B preface and link the subject titles in Volumes 2-8. Volume 1A provides a cumulative index to the Government Gazettes from 1990, setting out the Gazettes details of all Acts and their subordinate legislation grouped under subject titles chronologically. 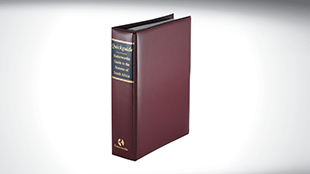 Volume 1B contains a table of statutes judicially considered. It links cases reported in the All South African Law Reports and South African Law Reports to the related sections of the laws of national, provincial and neighbouring governments. It provides chronological and alphabetical tables of statutes cross-referenced to subject titles with details of all repeals. The text is in English only and it is re-issued annually. Published in 41 A4 binders with the Acts arranged under 97 subject titles. This service provides a collection of all current consolidated and fully annotated Acts from 1910, with the exception of purely financial measures. Principal Acts appear in full with all amendments incorporated and amendment Acts are presented in a summarised form. Pending amendments not yet effective are set out in text boxes to distinguish them from current legislative provisions. Each title includes an alphabetical subject index and separate references to regulations and cases in a tabular format under the related sections of the Acts. There is an alphabetical table of cases cross-referenced to the related sections of the Acts. The Preliminary Section prefaces and links the various subject titles. It contains an alphabetical index to all the subject titles cross-referenced to the short titles of the Acts, and alphabetical and chronological tables of statutes cross-referenced to subject titles. The service is updated twice a year with replacement pages. It is a bilingual service (where an Act is available in Afrikaans, the Afrikaans text appears on the reverse side of the English text, allowing for easy comparison). Statutes Wording of Sections, subsections, etc. of unrepealed Acts immediately prior to amendment comprises two parts - a table of contents listing the sections of unrepealed Acts amended during the year of issue with reference to the related page numbers in the second part; and the full text of provisions of unrepealed Acts before their amendment in that year. Statutes Noter-up is an alert service to keep subscribers advised of all new material to be included in the loose-leaf Statutes replacement pages. It follows the subject title order of the main work and provides in abbreviated form information on new and amended statutes, decided cases and regulations. It is published quarterly as a stapled and punched booklet and each issue in the year is cumulative. Comprises of 26 principal Acts and their related regulations, rules, notices, table of cases and subject index. 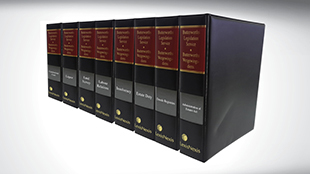 Available in English or Afrikaans as a collection of legislation or individually by Act and related legislation. 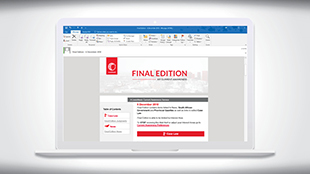 Service includes free access to Lexis Mobile, a portable digital reference tool for loose-leaf titles that allows you to access your content digitally. Enables verification of the validity of Acts and their application. It provides dates of commencement and repeal for provisions of each Act and cross-references Acts to the relevant subject titles in the loose-leaf and bound versions. Acts are listed both alphabetically and chronologically and all Bills pending and promulgated since 2008 are included.